Hortus Camdenensis | Arbutus unedo L.
‘The Arbutus is one of the greatest ornaments of a garden in the autumnal months, especially in those favoured situations in which it produces its fruit. As this takes twelve months to come to maturity, it is in perfection in the flowering season of the succeeding year.’ [LBC no.123/1818, Arbutus unedo rubra]. 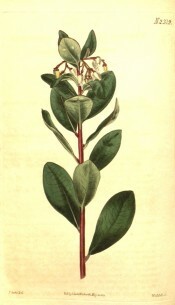 Curtis’s Botanical Magazine figured the variety integerrima. ‘That our plant, specimens of which we received from our friend John Walker, Esq. is a mere variety of A. Unedo, we are convinced, having received exactly similar specimens from Messrs. Loddiges and Sons, which they assured us were raised by them from seeds of A. Unedo. As a shrub it appears to be less ornamental than the common sort, from which it differs not only in the margins of the leaves being quite entire, but also in the branches being smooth.’ [BM t.2319/1822]. It was fashionable in the 1850s to grow Arbutus unedo in pots, and specimens from 2 to 4 feet in height are recorded covered in flowers and fruit. [FC p.10/1852]. Listed in all published catalogues. Probably a very early introduction to the gardens. Edward Macarthur provided seed to the Sydney Botanic Garden in 1823 under the name ‘Strawberry tree’.